Read the sections below for everything you need to know, including how to have an experimental procedure and the new procedure approval process. The EndoBarrier gastrointestinal liner from GI Dynamics attempts to mimic the effects of gastric bypass surgery without the risks of major surgery. It’s designed to work by inserting a flexible tube-like barrier into the top part of the small intestines. 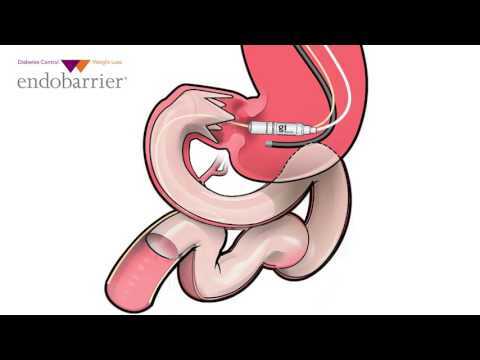 The barrier is placed endoscopically via the mouth and is proposed to help patients lose weight by delaying digestion until farther down the intestines. The Endobarrier appears to be less impactful than other options in terms of weight loss (about 19% average excess weight loss) and more geared towards improving health conditions like diabetes (1). Most of the diabetic patients in the clinical trials have shown improvement in the disease. The EndoBarrier is currently considered investigational in the United States and is undergoing clinical trials and investigational studies. However, the EndoBarrier is approved and available in multiple countries outside the U.S., including Australia. Note that as of March, 2015, the EndoBarrier trials were placed on hold by the FDA in the United States due to 4 cases of a bacterial infection of the liver out of 325 enrolled study subjects. Click here for more information. Sign up for our Bariatric Surgery Blog to receive updates. Laparoscopic gastric plication surgery is a restrictive procedure that shrinks the size of the stomach by making large folds in the lining of the stomach, thereby making the patient feel full sooner. The stomach size is reduced by about 70% during the procedure, which is performed laparoscopically (the surgeon makes small incisions in the abdomen through which surgical tools are passed). Unlike the more invasive gastric sleeve, gastric bypass and duodenal switch procedures, there is no removal or rearrangement of any part of the digestive system. And unlike gastric banding, there is no device left inside the body. Longer-term studies are limited, but short-term results are promising. During the first year following surgery, most patients lose between 40 and 70% of the excess weight. The procedure takes up to 2 hours to perform, and most patients remain in the hospital for 1 to 2 days following surgery. While this procedure is still "investigational", some practices are starting to offer it as a "self-pay" option. See our Gastric Plication Surgery page for additional details. Like the more established gastric plication procedure, the POSE Procedure works by reducing the size of the stomach – and therefore the amount of food it can hold – making the patient feel full sooner. However, unlike gastric plication, POSE is performed using a long tool inserted through the mouth and down into the stomach, making the POSE less invasive and scarless. During the procedure, the surgeon uses the long instrument to create folds in the stomach wall thus reducing its size. Early studies are promising. For example, a recent two year study (2) evaluated 147 POSE patients for one year following surgery. The 116 patients who were available for follow up reported an average percentage of excess weight loss of almost 45% (compared to 50 to 75% excess weight loss with the more established procedures) with no serious short or long-term problems. Transoral Gastric Volume Reduction is a relatively new restrictive procedure that has shown encouraging results. It works by sewing the sides of the stomach to create a feeling of fullness (it’s primarily restrictive) by not allowing the stomach to relax. More time and research are needed before we’ll feel comfortable recommending this procedure, but for now it looks promising. Endoscopic sleeve gastroplasty works by using an endoscope equipped with a suturing device. The endoscope is inserted into the patient’s mouth, down the esophagus, and into the stomach. The doctor then sutures the stomach using specialized patterns to decrease stomach size. The end result of endoscopic sleeve gastroplasty and gastric sleeve is similar; they both reduce the size of the stomach and make patients feel full sooner. The most comprehensive study on endoscopic sleeve gastroplasty weight loss followed up with 215 patients two years after the procedure. Average total body weight loss was 18.6% (4). This means a patient who is 300 pounds should expect to lose around 55 pounds. The most common endoscopic sleeve gastroplasty side effects include nausea and mild pain following the procedure. These symptoms typically subside within a few days and can be treated with pain and anti-nausea medication. Some patients report no side effects. Endoscopic sleeve gastroplasty is not covered by insurance. This may change if studies continue demonstrating safety and weight loss. See our page on Endoscopic Sleeve Gastroplasty for more information. The Full Sense Bariatric Device is a non-invasive weight loss instrument used to combat feelings of hunger. The device is compressed and pushed down into an endoscope where it expands at the top of the stomach. Once the device expands, it applies gentle pressure on the roof of the stomach and esophagus that lessens the feelings of hunger. In a group of over 100 participants, there was an average loss of 70% excess body weight in six months. While this initial, short-term study is promising, there haven’t been any long-term studies on this device, so it is unclear if these weight loss numbers are “durable” (will stay around in the long run). However, the doctor who pioneered this procedure claims that patients will continue to lose weight as long as the device remains in place. The Full Sense Bariatric device is not currently approved for use internationally or in the USA as it undergoes trials and regulatory examination. However, this procedure shows promise with its novel, non-invasive approach to weight loss. The Gastric Vest System™ is not worn on the outer body. Instead, think of it as a restrictive vest around your stomach organ. The procedure begins with doctors making a small incision in the abdominal wall. The gastric vest, made out of silicone, is then implanted around your stomach. The Gastric Vest System™ makes the size of your stomach smaller (and narrower) in order to make patients feel full sooner. The vest also increases the rate of gastric emptying, which means food will move through the stomach faster. Gastric Vest System™ surgeons report that weight loss results are better than other procedures on the market. More studies are needed to replicate weight loss results and prove its safety. Unlike the better-known gastric sleeve and gastric bypass procedures, there is no bleeding, cutting, or removal of organs during the vest procedure, and it is fully reversible. The Gastric Vest System™ is not on the market, but continues to be studied internationally. ReShape Biosciences(also known for the ReShape® gastric balloon and vBloc device) will manufacture this device in the USA if it becomes approved by the FDA. The Abiliti system is implanted near the stomach in a minimally invasive procedure. It works by detecting when a patient consumes food, then stimulating the stomach wall with low-energy electrical impulses. When the stomach wall is stimulated by these electrical impulses, it is believed to reduce hunger. A unique feature of the Abiliti system is its ability to monitor the user’s activity level. Physical activity levels are tracked and healthcare providers will review the data to ensure their patients are exercising. As a result, Abiliti users were shown to significantly increase their physical activity after the device was implanted (5). In a study of 34 obese patients, excess weight loss was 28.7% after 12 months (6). The device is well tolerated and rarely has side effects. Is is not approved in the United States and is only available in the United Kingdom, Germany, Spain, and Italy. As long as your surgeon is performing the procedure because he or she deems it to be in your best interest, the government will not step in to prevent an experimental weight loss surgery from being performed (7). To learn all about clinical trials, including their benefits and risks, see ClinicalTrials.gov’s Understanding Clinical Trials page. To review the current list of clinical trials for bariatric surgery, click here. If you aren’t working with a surgeon that is experienced with the surgery that you’re interested in, you may be able to find one if you are willing to participate in a clinical trial. In order to qualify, you’ll need to meet the specific criteria set by the researchers. Either way… after determining that you are working with an experienced and qualified weight loss surgeon, confirm that his or her hospital has a review board that oversees experimental procedures. Interview at least two or three surgeons (over the phone if there are not enough qualified surgeons in your area and you aren’t able to travel to meet them) and ask to speak directly with their patients who have received the procedure. Talk directly with a local qualified weight loss surgeon (even if they don’t perform experimental procedures) to get their take on the pros and cons. The consultations are usually free, an they will allow you to learn about your options directly from a surgeon. Free local surgeon consultation:Click here to schedule a free consultation with a local qualified surgeon about this procedures vs more established procedures. Phase I: Initial testing in a small group of 20 to 100 people to evaluate the safety and identify side effects of the new treatment. Phase II: A larger group of 100 to 300 people receive the treatment to further test its safety and effectiveness. Phase III: The treatment is given to an even larger group (up to 3,000 or more people) to "confirm its effectiveness, monitor side effects, compare it to commonly used treatments and collect information that will allow the experimental treatment to be used safely." This phase is typically where the FDA gets involved if a new device is being used (more on this below). Phase IV ("Post Marketing Surveillance Trial"): Ongoing testing after the treatment has been marketed and is widely in use for the purpose of evaluating long-term results. Class III devices are those that "support or sustain human life, are of substantial importance in preventing impairment of human health, or present a potential, unreasonable risk of illness or injury." New medical devices must receive U.S. Food & Drug Administration (FDA) Class III Premarket Approval Application (PMA) approval, the most stringent type of device marketing application, before they are allowed to be marketed and used (9). FDA approval or denial is determined by an "appropriate FDA advisory committee". Technically, the process is supposed to be completed within 180 days, but it often takes much longer. The FDA does not provide status updates regarding the review of particular devices. They only commit to "reviewing and approving or clearing products in a timely fashion."